The Waterpark is a perfect family day out whatever the weather, with both indoor and outdoor pools and attractions offering gallons of excitement for kids of all ages. 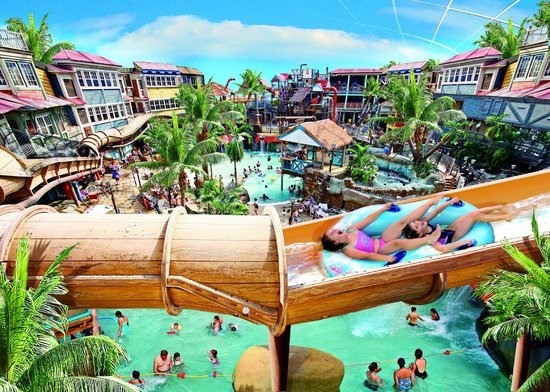 Bursting out of the middle of Splash Landings Hotel the Caribbean lagoon boasts hundreds of fantastic interactive water features, from lazy rivers, bubbly wubbly pools and crazy cannons, to the thrills and spills of our Master Blaster water rollercoaster! There are also facilities for our smaller guests, including the Little Leak - a shallow area with interactive play features, floats and slides for tiny tots. Plus children under 4 years old can access the Waterpark completely free! There is scrumptious food available, including great value sandwich meal deals and delicious smoothies and ice cream served on the pool side. If you fancy something a little more filling we also offer a pizza and pasta buffet menu in Flambo's Exotic Feast Restaurant, offering great views of the wacky Waterpark.